This was the very first Loot Anime crate and my brother and I (we share all these boxes) were pretty happy with it, personal thoughts on the overall crate and an estimated total value of the items can be found here after the review. 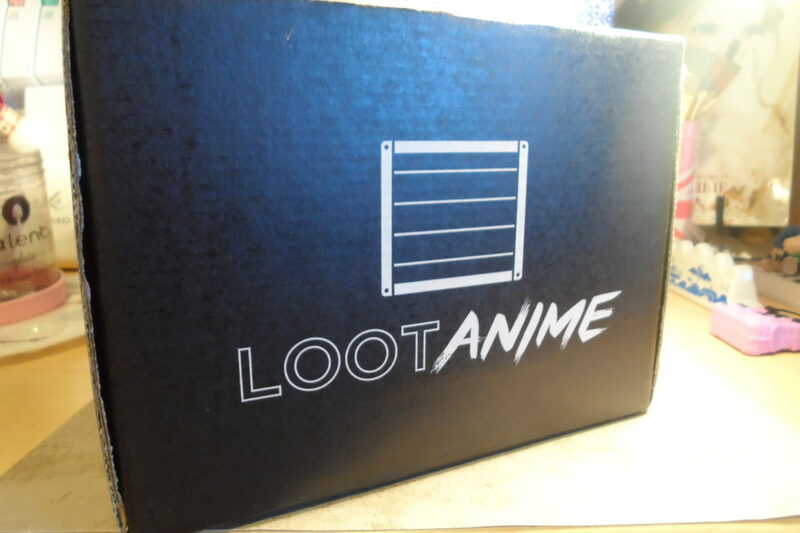 ^^ I’ll be starting with a little intro to Loot Anime and it’s parent company Loot Crate first, but if you’d like to jump straight to the review please click here. Series included in this crate: Naruto, Attack on Titan, The Seven Deadly Sins, + 1 blind box vinyl figure featuring a character from either Fairy Tail, Black Butler, Soul Eater, Attack on Titan, or Sword Art Online. Price: For subscribers living in the US, Loot Anime costs $24.95 + $5 shipping for one month, with it getting slightly cheaper the more months you buy at a time with subscription options at 1 month, 3 months, 6 months, and 12 months. They do ship internationally to quite a few countries, for more info about ordering from outside the US please view the International section of their Help page. For $3 off use the code ANIMEFB (currently working as of Jan 23 when I started this as a draft, if it’s expired check their FaceBook page for a new one) and if you’re willing, please use my referral link when you sign up. After the unfortunate focus of the last review (on Doki Doki Crate), I’d like to note that, to my knowledge, every item that has been in Loot Crate & Loot Anime have been authentic licensed merchandise. Loot Crate has had several one-off boxes in partnership with major companies; from Nintendo (3 Amiibo crates), BioWare (Mass Effect crate), Activision (Call of Duty crate), Disney & Lucasfilm (Star Wars crate), to GamesRadar+ (2 San Diego Comic-Con Exclusive crates), and even an upcoming crate on the TV series Firefly. Not to mention the exclusive official items they’ve had in many Loot Crates. So rest assured, you’ll definitely be getting your money’s worth with no worries of unofficial, fake, knockoff items. On their ‘About page’ it’s noted that they “…emphasize phenomenal support and content, and include gear from some of the most respected entertainment and consumer product companies in the world.” and on the ‘How it Works’ page: “We partner with great brands to deliver an epic experience every month!”. Now, onto the review on the actual Loot Anime BRAWL crate! Sealed with a large circle of tape. Starting to open, see something peeking out. Note the flaps at side, when tucked into box keeps sealed pretty well even without the tape. Failed to remember to get a photo of box once opened, but here’s everything in box aside from the poster and shirt + Ciel’s been deboxed. While it may look like an ordinary and plain black box on the outside – with only the Loot Anime logo atop it to let you know what it is – upon opening it this box undergoes a magical girl level transformation! With a full custom design on the inside in the same theme of the box (+referencing the series included). I recommend unfolding it, flipping it inside out, and then folding it again so that the colorful design can be seen at all times. Though if you enjoy your crate being more like a ninja, leaving it in its original state works too. Inside of box – I’ve reversed mine and refolded it. Initially the bottom panel, the only inner flap not to have extra art. Side design. I think inspired by Soul Eater? Other side design. I assume Black Butler inspired. As an artist, I adored this idea of having an awesome original piece of art included, and they did a great job with it. They had a wonderful artist choice in the talented Finni Chang, whose art I’ve stalked for quite a while (and you should too~!). If you’re interested in seeing more of Finni’s work you can find her on: twitter, tumblr, Facebook, deviantArt, and instagram. They’ve made great double use of this poster with a listing of all the items included in the box – with photos and short descriptions – on the opposite side of it (all the quotes here in the review about the items are from it). It’s size is around 15.5″ x 27″, give or take a tiny bit as I only had a little 5″ ruler to measure with. Pretty sure this is totally not meant to be included in any attempts to tally a total box value, but for the curious a poster from Finni Chang’s online shop is $20 (though of course if you were to put a value on this particular poster, it would likely be a tad lower for being folded up instead of nicely rolled, but stiiiiill~). Although I am insanely behind on Naruto (I’m pretty sure I reached Shippudden in the anime, and I’d gotten to just past Sai’s appearance in the manga), it’s a series I’ve always quite liked. I’ve got 3 well-loved Naruto plushies (well 4 if you count Sasuke who has gone missing since moving back to America XD) living amongst my plush collection if that tells you anything. Thus, I recognized the Akatsuki imagery immediately. Thickness is good, not too much to feel hot. With it stretched out + washed a couple times already you can only just see the redish tint where my finger is behind the shirt. Initial photo when first taken out of box. No annoying tag! Just printed on the shirt itself. another close up of print. Front. Stretched out over my desk chair. Back of shirt. Again stretched out over my desk chair. This is an exclusive item to Loot Anime so I cannot figure out an exact price. The closest I could find was this Akatsuki themed shirt also by Ripple Junction listed at $19.95, but clearly not quite the same quality (at least in my opinion). Something with an all over print is generally priced higher, and so I’d list this as closer to $25. This particular blind box item is by Funko, makers of the very popular Pop! vinyl figures, and is Series 1 of their Best of Anime Mystery Mini. It contains one random vinyl figure out of the 12 possible characters. Possible figures to get are: Natsu or Happy (Fairy Tail), Ciel or Sebastian (Black Butler), Soul or Maka (Soul Eater), Eren or Mikasa or a Titan (Attack on Titan), Kirito or Asuna or Heathcliff (Sword Art Online). Back of box. All of the possible characters, each are listed with a 1/12 chance to get. Top. As I accidentally threw out the box after opening, I’ve only got these 3 quick right out of crate photos of the box. My box contained Ciel. Although we were kinda hoping for Natsu or Happy, I don’t mind him too much. He stands perfectly on his own, but I do note his cane is juuuust a bit too short to actually touch the ground (it isn’t very noticeable though). Height is just about 2.5″. Working from my friend’s cosplay breakdown of this same outfit of Ciel’s and her write-up on his usual accessories, I have to say this is a pretty faithful recreation of him in mini form. They aren’t easy to spot because of his hair, but he does have the two blue stud earrings as well as both rings (even making sure to have the one on his thumb be silver and the one on his other hand gold). The handle to the cane is also properly smaller to the front and larger at back. The only things to note that aren’t exactly the same is the lack of visible white collar (honestly you wouldn’t be likely see it well anyhow as the shadow from his head would make it hard to notice), he’s only got three rows of buttons instead of four (considering he’s considerably shrunken down, I think that’s acceptable), & the heel of his shoe lacks the horizontal lines and are not quite the same shade (but that’s barely of note I think). As you can see there’s just a slight bit of space between cane and floor. Other side. Note earring and ring. Front view. Isn’t he cute? Copyright/trademark stuff on his feet. Top view~ You can see the seem line through middle of his head. Close up on body details. Note slight air bubble in the paint/vinyl at underarm. An attempt at pretty photgraphy. Note, either an eyelash or paint mishap with the blue by his eye? The only not exclusive item in the box. One blind box at retail price is listed as $7.99 on Amazon. Admittedly, I’ve never actually watched Attack on Titan… ^^;;; So while I thought this looked great and I know for any AoT fan this was an awesome item (as well as a very good choice by Loot Anime, as AoT is most definitely a hugely popular series), I personally wasn’t super excited by it. Quality does look rather nice though. I like the coloring choice of red splatter on the blue. Just taken out of the crate. Natural light. Styrofoam layer. Can’t even see it yet. Securely held in the packaging, with a layer of styrofoam above and below, indented with the mug’s shape so it stays put. It’s clear glass with a slight green tint, most notable at the base. With the series name on one side and iconic corps logo image on the other. Has enough of a weight to it I think and is a good size. Bottom of mug. With copyright info. Inside of mug. You can note the glass thickness also. Design looks very nice and clear. Design is well placed also. Angled view, handle looks and felt strong enough. Back of mug, with the Attack on Titan logo in English and Japanese. At minimum $14.99 (judging from other AoT mugs by the same company), though I personally feel it might be closer to $20 (considering it’s exclusive to the crate). I love this. While not a big ticket item or something from any series, it’s a great touch. Plus it’s always nice to get recognized as being a part of something since it’s start. And, I just really enjoy charms/keychains. loop length has good length, plus lobster clasp makes for easier attaching. Pretty cherry blossom and some kanji also engraved on other side. In plastic still, next to the photo on the poster. We think it would be fair to value this at around $4.99 (feel free to suggest a different value in the comments if you think this is too low / high). The exclusive tin is nice and if I were an Attack on Titan fan I’d certainly display it somewhere. It comes sealed in plastic, and contains a total of 15 average sized bandages (5 of each design). Plenty of space to add in some more bandages or a mini-size ointment of some-kind for a tiny first-aid kid. Still in plastic, front view. Two of the 3 designs. Next to the poster photo of it. Bandages are folded to fit, but there is 5 of each design. As these are exclusive, I don’t actually know what exactly to value these at, my best comparison is some other AoT bandages I found on Ami Ami; list price is 2,462 Yen (around $20 according to Google) with their discounted price on it as 1,840 Yen (around $15.50, once again according to Google). NOTE: As of just before posting this, I checked and have now seen this being sold on ebay for $7.99/$9.99/$11.99. So you decide what you think the value on this is~? My brother and enjoyed it and will likely buy the next volume at some point. I’m definitely hoping for some more manga in future editions of Loot Anime. If you’re curious , the normal vol1 cover only has the blond boy + the pig (seen on back cover) + the main girl (not pictured). Quick shot to give you an idea of the art style. I’m mildly curious why it says LootCrate exclusive instead of LootAnime, but that is the parent company. First chapter page, with the more shaded art. Retail price is $10.99 as listed on the back cover, though if you don’t mind a non-exclusive cover Amazon does have it for a tiny bit cheaper at $9.68. Personally, I really love the concept of an anime focused monthly subscription box. And I like that Loot Anime has a theme for each month’s crate so if you’re unsure about a particular theme you could always cancel for that month or only purchase on months with themes you’re into. And for our final commercial break, 😛 I give you my last request to please use my referral link (http://looted.by/dsjsC) if you do decide to sign up. Thank you so much for reading this review and please don’t hesitate to leave a comment with your thoughts or suggestions below!